A review in Frieze last month, where critic Wes Hill invoked a woefully inaccurate notion of Zombie Formalism in describing the artist’s recent show in Sydney, prompts this response. Some overlap with previous essays on Zombie Formalism and Frank Stella is unavoidable. In any case the work of Dale Frank provides an interesting perspective from which to further consider the state of abstract painting. The artist, although peripheral these days, achieved an international reputation in the eighties and nineties, firstly as a Neo-Expressionist on the Transavantgarde wing, dealing with bodily relations in an intensely linear, outsider style and enjoying a stream of articles in Flash Art, patronage by influential curators such as Achille Bonito Oliva and Rene Block and inclusion in a number of international surveys. 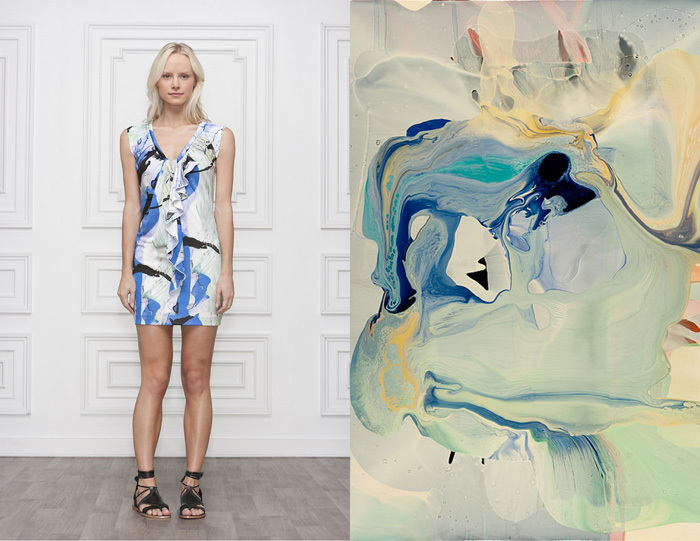 His painting then swiftly moved to more abstract territory, becoming more eclectic and irreverent. Essentially the work paces the tendency to Maximalism and the arch, synthesising tendency soon invites free-standing objects and broaches installation. 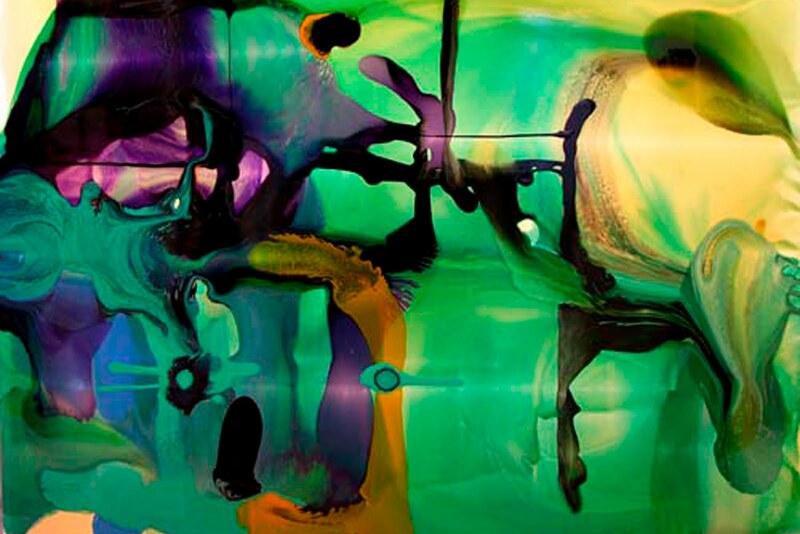 Where painters from Albert Oehlen to Fiona Rae stressed eclecticism to abstract elements within a work, Frank is equally keen to distribute it across works, while nevertheless remaining dedicated to abstraction. It is a tricky position and one that hardly accords him greater distinction. By the end of the nineties the artist concentrated on his home market of Australia and was honoured with a career survey at the Museum of Contemporary Art in Sydney. 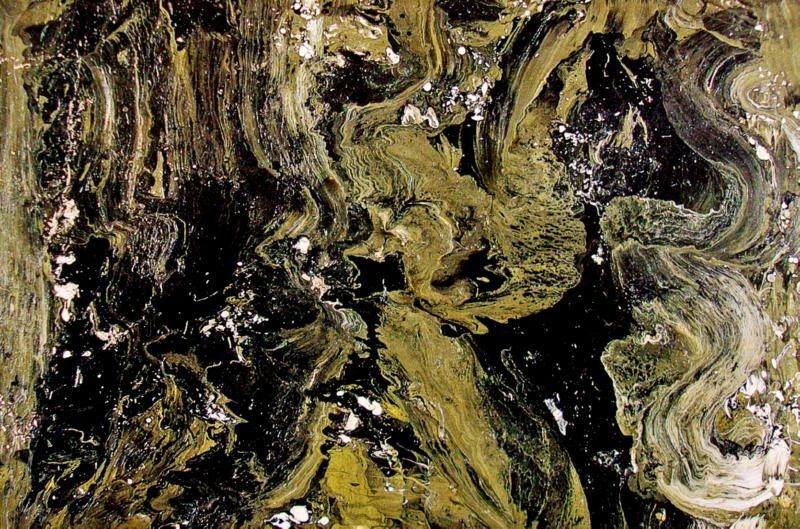 It was a pivotal moment for the artist in the most pivotal of years: 2000. The switch from Neo-Expressionism to Post Modernism is interesting in itself, but it is the artist’s subsequent work that has actually become his signature. Maximalism is abandoned and he concentrates on elaborate pouring and channelling of novel pigment concoctions on various supports, more or less applied at floor level. Here the work stakes out a sort of Post-Minimalist Baroque, recalling a line of American painters stretching back to Jackson Pollock and including Helen Frankenthaler, Morris Louis, Jules Olitski, Larry Poons and Linda Bengalis. But concerns with fundamental shape, line or edge, colour identity, ground and symmetry are now tortured into lavish and ingenious phantasmagoria, barely rising beyond the level of Rorschach inkblots or lava lamps. Abstraction is reduced to an attractive and decorative flourish. 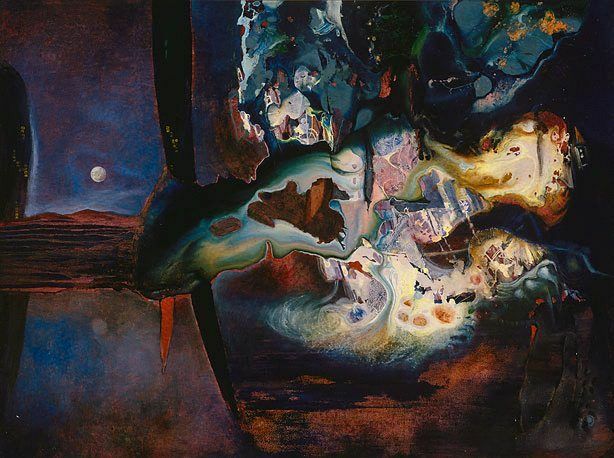 There are also Australian precedents, in the work of Surrealist, James Gleeson and Informal abstractionist Ralph Balson, which add to a sense of tradition, but puzzlingly, Frank’s work is still promoted as progressive or experimental, although any sense of progress or experiment is confined to matters of chemistry and technique. There are two issues worth considering. The first is whether abstraction, as a quest for pictorial fundamentals still has any relevance. The second is why the artist, so ambitious and driven in the first half of his career, should be content with such an unpromising niche. On the first issue, the short answer is that it is really a matter of diminishing returns on a growing investment. At some point there are simply better returns to be had elsewhere in painting. Abstraction no longer has the intellectual or historical capital to repay efforts to renew or reward it. It can at best deal in trivialities, niceties. The long answer is that it is unlikely to disappear entirely, but the quest for fundamentals has largely been superceded by painting’s relation to common print practices for pictures. One looks inward for absolutes; the other looks outward and compares itself against standards of efficient duplication; measures differences in meaning and currency there. Each undertakes an audit of painting’s resources, but one looks for ideals while the other gauges established practice. The course of much of the last forty years of the twentieth century charts the transition from one project to the other, even if most art historians are still in denial. It is notable however that the great critical champions of abstraction in the sixties, such as Clement Greenberg and Michael Fried find no obvious successors, no bold new advocates for purity of means or intrinsic properties for painting. As doctrine or dogma, the faith simply splinters and dissipates throughout the seventies (see also Zombie Formalism). There is nothing especially painterly about pouring paint, without declaring quantity, surface and its implicitly horizontal situation. There are no shapes or colours engineered through pouring that hold any vital relevance to pictures, without specifying which kind of pictures and compromising the level of abstraction. Similarly, there is nothing fundamentally painterly about runniness, marbling or sedimentation to pigment without declaring a purpose. Paint has more options, painting has still more. As self-reference, the exercise can never quite close the loop and refer exclusively to all pictures. To assert for example, mere coloured coatings as a property of pictures is obviously trivial. 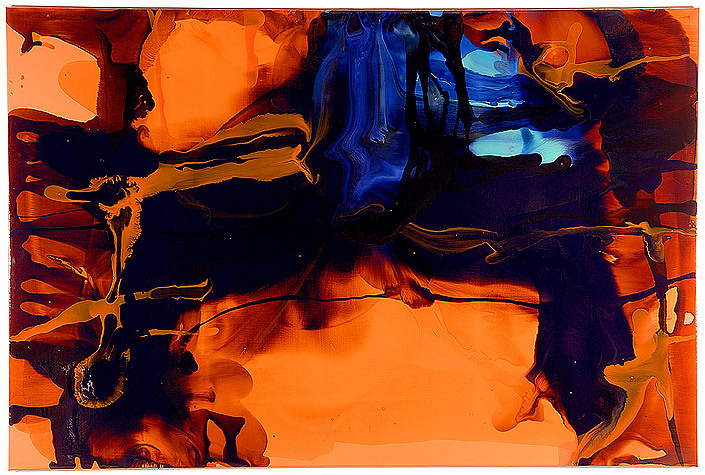 ‘The medium’, as proponents like to term painting, ultimately refuses to be confined to matters of materials and technique, chemistry and instrument. Each formulation and variation only brings its own content while form divorced of all content actually turns out to be nothing but wishful thinking. If the course of twentieth century painting carries any lesson for us, it establishes this much. At this point we turn from theory to current practice. The exhausted or moribund status of abstraction nevertheless holds attraction for younger artists anxious to diversify their efforts. Abstraction enjoys a kind of ghostly after-life as respectable if unexciting genre for artists of a certain generation and it is this somewhat complacent attitude and feeble efforts that earn the name Zombie Formalism, at least from critics old enough to remember the rigours of Minimalism. Zombie Formalists are the antithesis of the dedicated painter intent upon the fundamentals. They divide their time across the whole spectrum of the fine arts, from performance to video, photography, sculpture, assemblage, installation, curating and publishing. They have no particular interest in form, indeed little real appreciation of it. When technical issues arise they outsource or commission. The movement emerged around 2010 and would seem to have peaked in 2015, at least to judge from auction prices. Hill’s definition as ‘the kind of abstract art in which novelty is often mistaken for originality’ utterly traduces the character of the movement. There are no claims for originality to Zombie Formalism, quite the contrary. The work aspires to no more than dutifully maintaining an established category. At best admirers detect a diligent energy or attitude there that detractors can only find pathetic. The real claim lies with the artist’s supposed range of interests, amongst which abstraction ticks one more box. And it is important that the boxes register as precisely that: boxes. While comparison with Frank’s recent work is understandable given the times, it is doubtful he wears the term as ‘a badge of honour,’ as Hill suggests. Frank is too old, too dedicated, the work too florid and melodramatic, too elaborate and gimmicky. It tries too hard. Frank wants far more from his abstraction than the Zombie Formalist but at the same time, he too contributes to the project’s steady devaluation. Frank’s work is closer to the Spin paintings of Damien Hirst, but where they bluntly allude to a segment on the BBC-TV children’s programme, Blue Peter and welcome abstraction’s integration with more mundane amusements, Frank’s outpourings offer nothing so direct or reassuring and suffer as a consequence. The work is kitsch or vulgar as abstraction but never quite finds focus or application (as laminated tabletop, say) cannot go the whole hog, as multiples, merchandising and marketing. 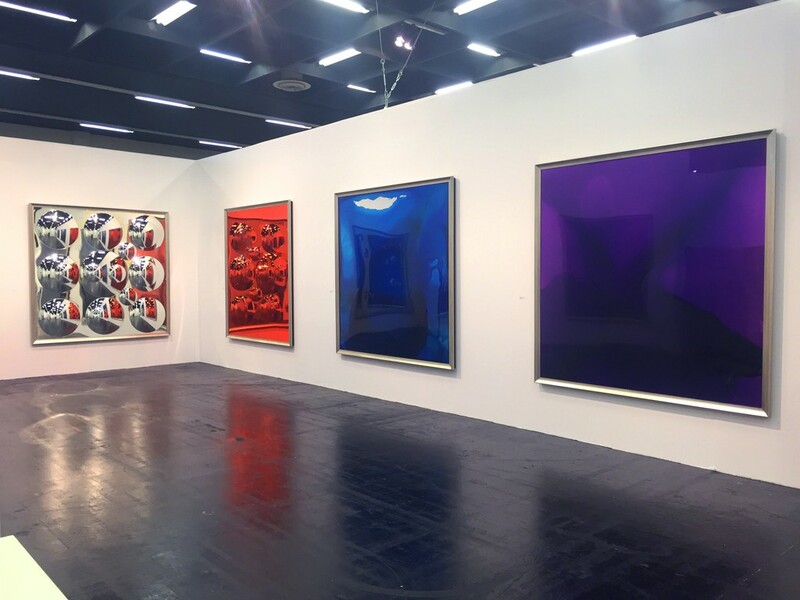 Where Hirst can blithely turn to projects in fabrication – even of figurative painting - corporate promotion, hospitality, curating and installation, Frank loiters at the edge of fashion, dallies with furniture in a number of exhibitions but draws the line at industrial design. The project is compromised, caught between a rock and a hard place. It has no patience with the fundamentalist rigour of its precedents (for good reason) but it cannot really accommodate the daunting array of related cultural artefacts that then beg appreciation. It is here that the artist gently slips from front-runner to journeyman. His days in the avant-garde began as a performance artist in the late seventies before switching to Neo-Expressionism and have only sporadically returned to performance, usually with commissioned groups of performers, somewhat after the manner of a Vanessa Beecroft or Santiago Sierra. Similarly, the work has often approached installation, most notably in the staged discotheque ‘I’m Only Dancing’ at the Roslyn Oxley9 Gallery in Sydney in 1995. But these are really occasional side projects by the turn of the century. By then it is not so much about an artist covering all bases but discovering his limits, setting priorities. The eclecticism quickly dwindles as Frank literally settles on what matters most to him. It is here we see the themes of bodily immersion and fluidity distilled, set in counterpoint to the notably inconsequential or topical titles. An impossible verbal tag counters a suave visual flux. This is where the artist’s oeuvre finally gels (to labour the metaphor). It also brings us to the second issue. While Frank’s dedication to fashionable trends is obvious, an underlying thread or consistency - apart from fashion - is harder to discern. There comes a point however, where he must consolidate this or risk becoming no more than a capricious follower of others. A mid-career survey is certainly a convenient point at which to take stock, but the frantic eclecticism and forthright parodies of Pollock, Louis, Polke, Klein and others, (this, despite the artist’s claim “Quotation was never a consideration when I was doing the work”) also announce a little too much ambition, not quite enough substance, not to say honesty. There is cause for pause at a formal level. The elusive thread actually lies in the directness and immediacy of the work and its content, with briefly being part of the work and entering its world. It is easy to see how concerns with bodily endurance and exposure in his early performances find correspondence with the Transavantgarde’s emphasis upon the figure as expressive cipher for states of mind, deeper, sometimes darker forces. 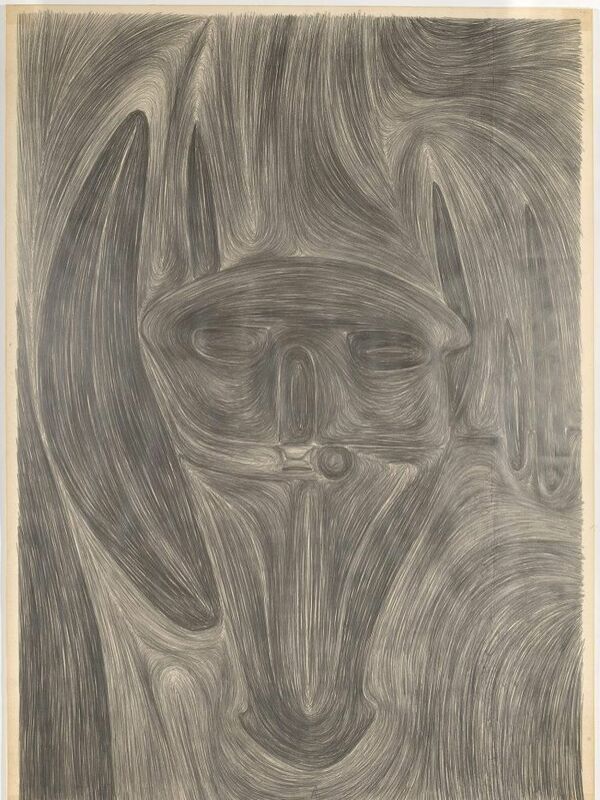 Frank’s first drawings in the eighties echo outsider art in their emanating motifs, obsessive schemas, perhaps recalling someone like Martin Ramirez, whose work gained prominence in the seventies. Paintings soon carry the swirling emanations to fluid motifs, as in Two Moons (1984) where faces or bodies are reduced to distant glowing orbs beyond a glittering sea. 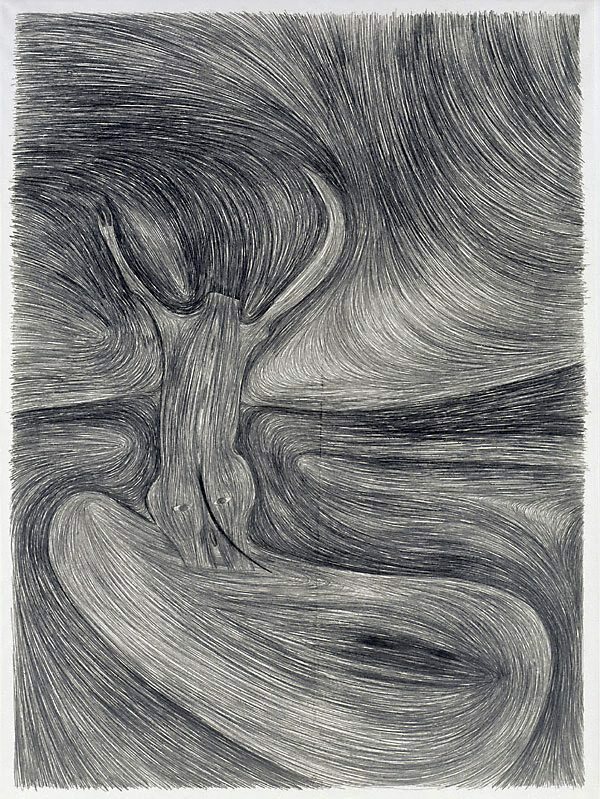 It is the sinuous graphic flow that expresses the feeling of immersion, of connecting with powerful surrounding currents. Yet as the figure grows more remote or abstract, interestingly the connection is broken, the current interrupted with layers of stricter motifs. The problem is that beyond the figure the flow soon encounters abstraction and this is far less responsive to his efforts. Abstraction presents an obstruction to his command, to the surging flow that carries him from presence to presentation. Unlike appeals to the primitive or intuitive, abstraction is an intensely scrutinised affair, basically the domain of others. In response, Frank suddenly becomes self-conscious and titles like Modern Art (1988) announce a far more detached and derisory tone. If there is an abrupt break in the artist’s development, it occurs here, in the mid-eighties. All the soul-searching would seem to reveal only a core flippancy. From introspective outsider the artist has suddenly become cynical sophisticate. The shift suggests the influence of German artists with growing acclaim at the time. Works such as The Primitive Painting (1985) acquire the distinctive lateral blurring of Gerhard Richter, for example, while works displaying a variety of textile supports, novel and augmented emulsions, such as Mike’s Hairy Armpit (1988) attest to the impact of Sigmar Polke. Polke’s work also contains notorious parodies of abstraction. Younger Germans like Martin Kippenberger and Albert Oehlen take the attitude much further throughout the eighties and nineties; readily shuttle between abstraction and figuration even within a single painting. Frank, while allowing expanded figurative schemas, never quite encompasses that dissonance. His flow is really between hard-edge geometry, biomorphic shapes, gesture and layers. 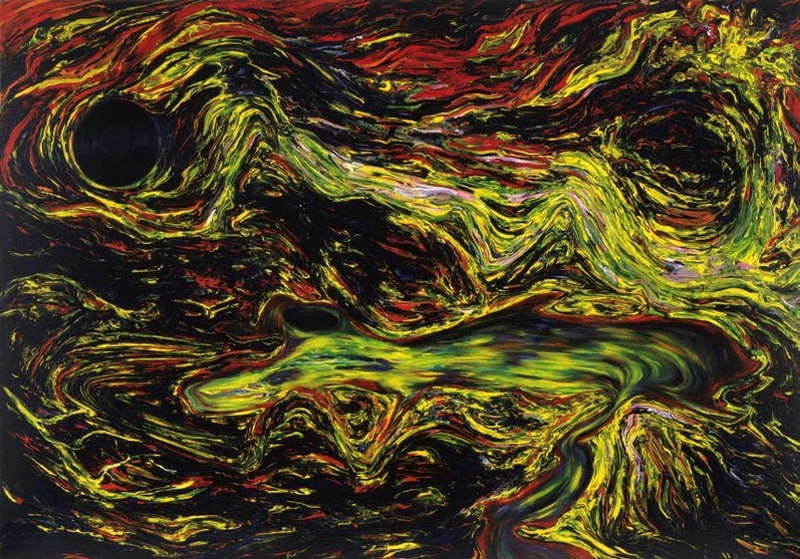 Around this time the flow also becomes literal, as in Balancing the Bearded Woman (1987), with poured enamels contributing lurid marbling. 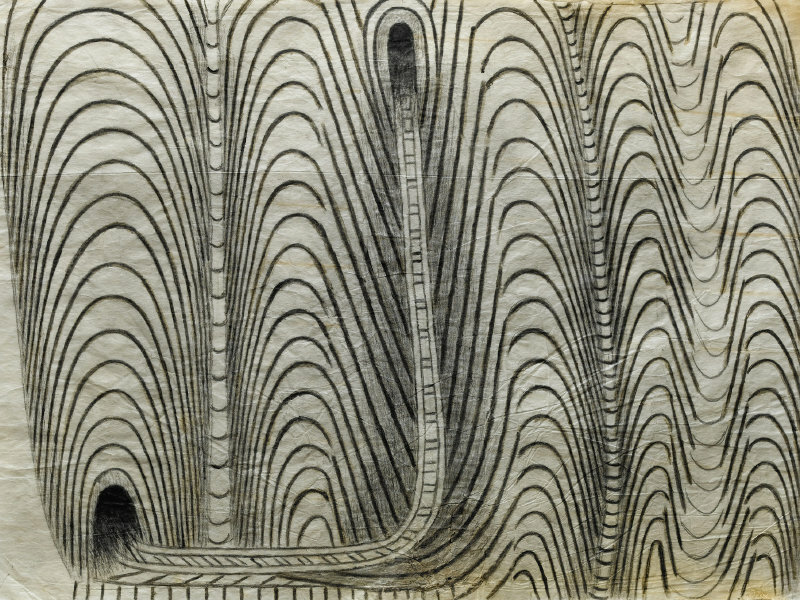 But a compendium of techniques and motifs only diverts the flow into an exercise in graphics; is too diffuse to really declare the artist’s efforts as surging impact. Pacing and paraphrasing the signature of others offers a more concise statement of the issue. But it does leave the flow steered by fame and clichés and looking rather shallow. The eclecticism and parody announce a familiar anxiety of influence not easily alleviated. The artist must find a way of sequestering the flow from rivals, with seeing it in its own right, as his territory. But this is really to revive just the kind of Modernism he has spent a career dismissing. It is an exquisite dilemma. The worldly insider must go with the flow, even when the flow has nowhere left to go. He is a trapped insider; but his solution is slick, his means discreet. The work concentrates on pigments augmented with commercial varnish and other novel emulsions, giving them great translucence and lustre. Yet while the bright and shiny may seem foremost and felicitous, the generous pourings are not quite on the level. The flow is a sleight-of-hand, deftly steered by inserted wedges and blocks beneath the support, determining subtle gradients and duration for flow. The only online review to seriously appreciate the implications for this is John Engelen’s review from 2010. Ironically, it appears on a site dedicated to design. The artist’s performance here is intensely manipulative, from behind the scenes or at a remove. It maintains the appearance of chemical accident and spontaneous dispersal without disclosing a shifting, unseen terrain. The result is merely picturesque or pretty, because it is not the whole story and not a particularly interesting story. It is a flow that looks good largely because it conceals its means, cherry-picks outcomes. The works are thus no less superficial for dispensing with eclecticism. The anxiety now is with a flow that is not exactly paint, not just poured and not so much flowing as carefully pooled and channelled, diverted and drained. The artist’s formal plumbing inevitably suggests a metaphor for his candour, where Frank can never be ingenuous, when there is opportunity to be ingenious. The work becomes about the behind-the-scenes moves, the calculation and control of not so much a flow as a front. And it is a facade that grows increasingly facetious as the artist switches to sheets of Perspex as supports, the work presented with the Perspex to the front, adding to transparency and reflectance. 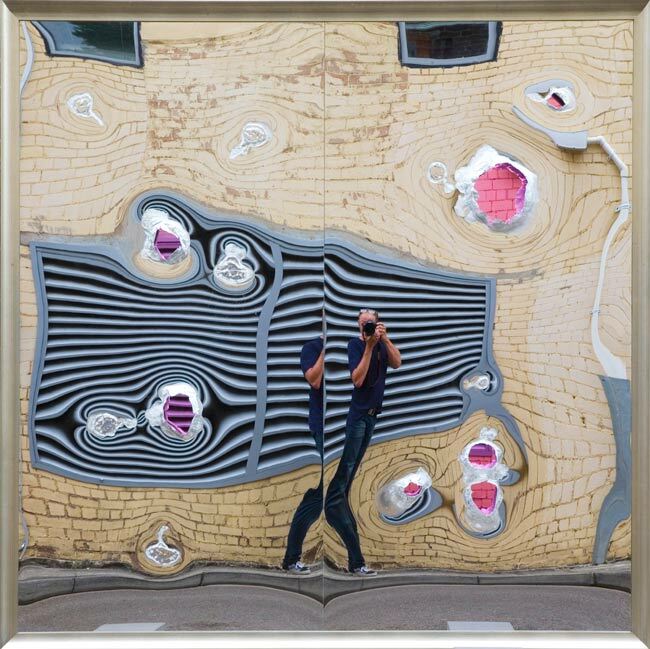 More recent works use an anodised mirror finish to the Perspex with augmented undulations now delivering a funhouse distortion to reflections – indeed, presenting a challenge to even document. These more elaborate and expensive fabrications recall Hirst and Jeff Koons and yet the flow of the reflection between convex and concave areas of the surface is entirely consistent with the flow to his work of the early eighties. The difference of course, is that the paintings and drawings proposed a sincere and profound immersion in feeling, while the recent work reduces the flow to a fairground amusement and sleek insulation against deeper engagement. For all the consistency, it traces a regrettable development, not so much for the fate of abstraction or painting but for an artist too anxious to remain in step with his times, for times inflating an aesthetic to unsustainable proportions.